The war in Afghanistan — a subject that has generated periodic spikes in media interest but not a high level of sustained coverage — was back atop the mainstream news agenda last week. And this time, the catalyst was neither violence on the ground nor deliberations in Washington, but the leak of about 90,000 classified war reports by a whistleblower website. Driven by WikiLeaks’ dissemination of those documents — which highlighted the difficult challenges faced by NATO forces — Afghanistan led the news for the week of July 26-Aug. 1, according to the Pew Research Center’s Project for Excellence in Journalism. Taken together, coverage of the WikiLeaks saga and the overall war effort combined to fill 19% of the newshole. Afghanistan coverage has generally followed a roller-coaster trajectory in the past year. It jumped to 9% of the newshole in the last quarter of 2009 when President Obama decided on his surge of 30,000 troops. It then plunged to only 3% in the first five months of 2010. In late June, coverage spiked again when Obama removed Gen. Stanley McChrystal as Afghanistan commander after Rolling Stone published negative comments by him and his staff about the administration. The WikiLeaks story triggered a renewed debate over the wisdom of U.S. strategy in Afghanistan. But it remains to be seen how long that will keep the war prominent in the headlines. A number of other events, though, also competed for space last week. Indeed, four of the five media sectors examined in PEJ’s News Coverage Index had different lead stories. The WikiLeaks story led network news, but the economy topped the newspaper and radio sectors, the Gulf oil spill was No. 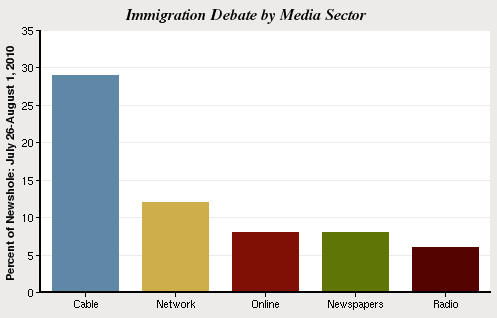 1 online and immigration was first in the cable sector. The announced departure of much-criticized Tony Hayward as CEO of BP helped fuel the continuing coverage of the Gulf oil spill, which filled 12% of the newshole from July 26-Aug. 1 — the same level as the previous week. And the economy accounted for 10% of the week’s coverage, with no particular economic storyline dominating. But it’s fair to say that there was little in last week’s news to contradict the news narrative that the nation’s financial health is still in fragile shape. The WikiLeaks story was the biggest aspect of Afghanistan-related coverage last week and it generated the most attention in the network news sector, at 20% of the airtime studied. The classified Afghanistan field reports were provided by the three-year-old WikiLeaks group — which specializes in unearthing secret information — to three outlets: the New York Times, the British newspaper The Guardian and the German magazine Der Spiegel. Among the key findings was the suggestion, as the Times reported on July 26, that Pakistan, “an ostensible ally of the United States,” allows its intelligence service to aid the Taliban in its fight against the U.S. and the Afghan government. The story then quickly pivoted to the impact of the leaks on U.S. policy and politics. The next day, the Times noted that the “documents increased pressure on President Obama to defend his war strategy. On Capitol Hill, a leading Senate Democrat said the documents, with their detailed account of a war faring even more poorly than two administrations had portrayed,” would intensify congressional scrutiny of Mr. Obama’s policy. And a July 29 report in the Los Angeles Times cast some doubt on one of the other explosive suggestions in the documents — the idea that Taliban and its allies may have surface-to-air missiles. While the Pentagon warned that the documents could put lives at risk in Afghanistan and pressed forward for an investigation into the leak, it was unclear by week’s end whether the classified papers would have any significant impact on the conduct of the war itself. U.S. District Court Judge Susan Bolton’s July 28 ruling blocking key portions of Arizona’s immigration law — including one mandating a check of immigration status when a person is stopped for other violations — quickly became a hot political topic. The story dominated cable news, where it filled 29% of the airtime studied by PEJ. And while Bolton’s decision was portrayed as a legal win for the administration that had challenged the Arizona law, the verdict was not necessarily the same when it came to the political implications. During a July 28 appearance on Rachel Maddow’s MSNBC show, Nate Silver — founder of the FiveThirtyEight, a political website which pays particular attention to polling data and number crunching — saw initial gains for the Republicans. 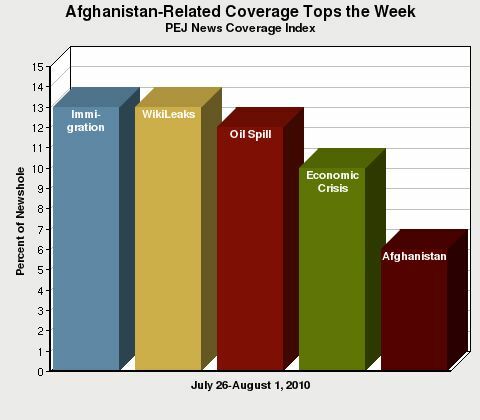 The oil spill, at 12% of the week’s newshole, continued to make the roster of top stories, although at levels far reduced from its peak coverage. It did register as the No. 1 story in the online sector (19%) and coverage was dominated by a focus on BP and on the departure of Tony Hayward, who became a lightning rod for much of the anger aimed at the oil company. Coverage of the economy fell to 10% from July 26-Aug.1, down significantly from 17% the previous week when extending unemployment benefits and Wall Street reform drove the coverage. Even so, it did end up as the No. 1 story in two sectors last week, newspapers and radio (both at 14%). Among the developments making news last week was the decision by Bell California city council members to cut their salaries by 90% when a public outcry ensued after the Los Angeles Times reported on number of hefty salaries among public officials there. One week after he was overshadowed by Shirley Sherrod — the USDA employee forced to resign following the release of an edited video of her speaking to the NAACP — Barack Obama returned to his usual position as the top newsmaker. The No. 2 newsmaker was Democratic Rep. Charles Rangel who figured in 4% of the stories after the House Ethics Committee charged the former Ways and Means Committee chair with 13 counts of ethics violations. He was followed by another figure whose recent headlines haven’t been kind, departing BP boss Tony Hayward (3%). 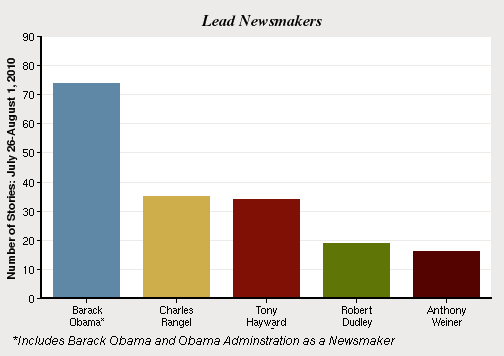 Robert Dudley, the man tapped to replace Hayward at BP was the fourth-leading newsmaker, at 2% of the stories. And coming in as No. 5 was another New York Democratic congressman, Anthony Weiner (also 2%), who erupted in an attention-getting outburst against Republicans during a debate over a bill that would provide money to pay health costs for 9/11 first responders. Even in a time of increasingly angry political rhetoric, the congressman’s behavior stood out. “Weiner Goes Ballistic on the House Floor,” declared the headline on the Forbes website. PEJ’s weekly News Coverage Index examines the news agenda of 52 different outlets from five sectors of the media: print, online, network TV, cable and radio. The weekly study, which includes some 1,100 stories, is designed to provide news consumers, journalists and researchers with hard data about what stories and topics the media are covering, the trajectories of that media narrative and differences among news platforms. The percentages are based on “newshole,” or the space devoted to each subject in print and online and time on radio and TV. In addition, these reports also include a rundown of the week’s leading newsmakers, a designation given to people who account for at least 50% of a given story. Learn more about the NCI, including a list of outlets and methodology, at journalism.org.